The west coast of this wide, brown land features some of the most spectacular and rare landscapes in the world. Big skies, deep gorges, plains that stretch to the horizon and all the colours of the rainbow. It’s country tied deeply to ancient lore and generations of stories and a place that will lay claim to your heart. From sultry Darwin you’ll make your way down the coast. The prehistoric and incredibly beautiful Katherine Gorge will astound with its sparkling waters and deep sandstone cliffs, before you find yourself in rich farming country and the stunning El Questro Wilderness Park. Seek out rich wildlife before visiting the world’s largest diamond mine. Meet a traditional land owner and discover traditional culture and storytelling. Ride a camel along the famous Cable Beach or get up close with a friendly bottlenose dolphin in the turquoise waters of Monkey Mia before arriving in lovely Perth. Welcome to cosmopolitan Darwin for a two night stay. Cruise on the Adelaide River, home to the ‘jumping crocodiles’ or take a day trip to Litchfield National Park. Alternatively, enjoy a cruise on Darwin Harbour at sunset, take the hop-on-hop-off bus around town or do the WWII Bombing of Darwin tour. Cruise on the Yellow Water Billabong, spotting crocodiles and bird life. Enjoy your overnight stay in Kakadu. Discover the World Heritage-listed Kakadu National Park. Be amazed by the wildlife and Aboriginal art. Your home for tonight is Katherine. Your dinner cruise through Katherine Gorge will transport you into the spiritual world of the Jawoyn people and their remarkable culture. Explore the largest lake in the Southern Hemisphere, Lake Argyle, before joining your cruise down the spectacular Ord River. Relax tonight in Kununurra. Optional flight - Take an optional flight over the Bungle Bungles for a bird’s eye view of these massive sandstone structures. (Additional expense). Your local guide will take you on a tour of Kununurra. Learn about the local importance of the sandalwood tree plus discover the Ord River Irrigation Scheme. Follow the Cockburn Range to the acclaimed El Questro Wilderness Park and your Special Stay for the next two nights. Optional El Questro Homestead upgrade - Opportunity to upgrade your stay to the deluxe El Questro Homestead. (Additional expense, must be booked before departure). Cruise through the Chamberlain Gorge or discover the traditional culture and history of El Questro. Alternatively join a park ranger on a bird spotting walk. Admire the striking colours of the massive Carr Boyd Ranges as you travel to the world’s largest single producers of diamonds, the Argyle Diamond Mine. Join your Indigenous guide for a tour and lunch. Our overnight stay tonight is Halls Creek . Cruise this afternoon on Geikie Gorge. Look out for sawfish, stingrays and freshwater crocodiles. Overnight is spent at Fitzroy Crossing. Meet a traditional land owner at the remarkable Boab prison tree and enjoy a cup of tea with an old drover. Optional flight - Take an optional scenic flight over the Buccaneer Archipelago including the Horizontal Falls. (Additional expense). Continue on to Broome with its white sandy beaches and tropical waters for a two night stay. 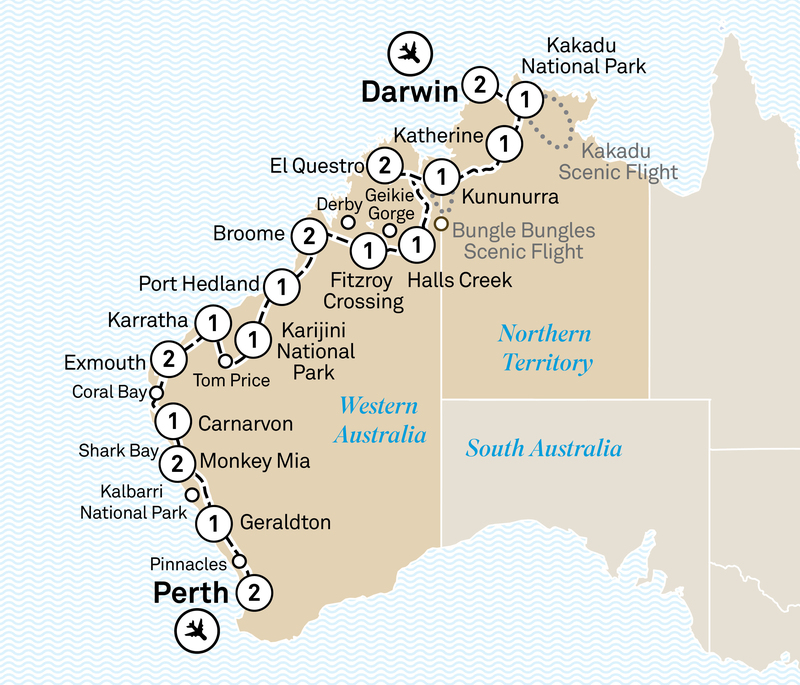 Take a tour of Broome on a Harley-Davidson Trike or ride camels along the famous Cable Beach. Alternatively, visit Willie Creek Pearl Farm or enjoy a town tour that includes sunset on Cable Beach. Optional flight - Experience the incredible Horizontal Falls on an exhilarating seaplane flight. (Additional expense, replaces Scenic Freechoice activities). Explore the Pilbara and view some of the world’s most ancient landscapes. Discover the secrets of Port Hedland from your afternoon Port Hedland Harbour Cruise. Overnight stay in Port Hedland. Put on your hard hat for a tour of the Mt Tom Price iron ore mine. Overnight at Karijini National Park. Explore the ancient gorges and waterfalls of Karijini National Park. Visit Fortescue Falls and the Dale and Joffre Gorges for astounding views. Later, view the spectacular Hamersley Range with its sheer walls of rock, layered in many colours. Stay overnight in Karratha. Travel along the North West Coastal highway to Exmouth for a two night stay at your gorgeous resort. Start your day with a Ningaloo Reef coral viewing cruise before visiting historic Vlamingh Head Lighthouse for stunning views over Lighthouse Bay. Enjoy a drink at the resort’s bar and watch the trawlers head out to begin their evening’s work. Explore Coral Bay where the turquoise blue of the ocean meets the sandy bay with Ningaloo Reef underneath. You’ll spend the night at Carnarvon. Travel to Hamelin Pool to see the world’s best known colony of stromatolites. Enjoy two nights at Monkey Mia, home to bottle-nosed dolphins. This morning, cherish the opportunity to see the dolphins under the supervision of a national park ranger. Cruise through Shark Bay searching for dugong or sail into the sunset. Alternatively, dine on damper as you listen to stories of the Dreamtime. See Shell Beach then continue to Kalbarri National Park and stop at Hawks Head for views of Murchison River Gorge. At Geraldton visit the HMAS Sydney memorial before arriving at your overnight stay. Marvel at the extraordinary Pinnacles during your visit to Nambung National Park. Enjoy a two night Special Stay in Perth. Journey to Rottnest Island for a chance to spot a quokka or partake in a food and wine trail through Swan Valley. Alternatively, take a walking tour of Perth, cruise to the Port of Fremantle or enjoy an Upper Swan Valley cruise with lunch. After breakfast, bid farewell to your new friends, before returning home with many great memories.